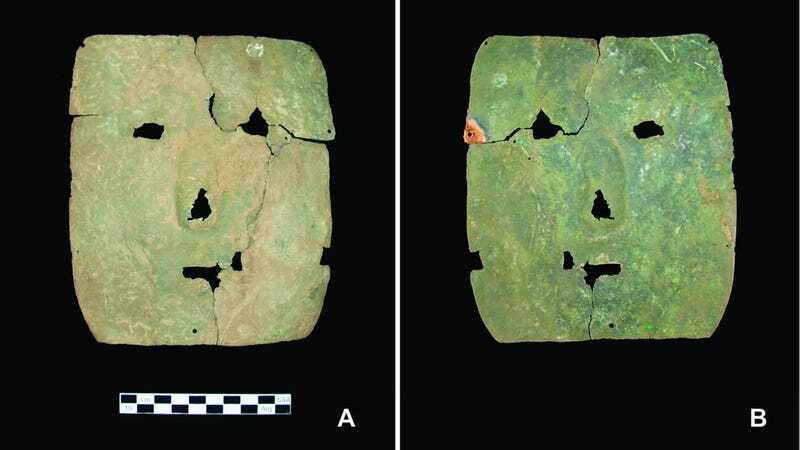 A square-shaped copper mask pulled from a tomb in the southern Andes is resetting our notions of where and when sophisticated metallurgy first appeared in pre-Hispanic South America. Archaeological evidence suggests that metallurgy in pre-Columbian America first appeared in the Andes, with Peru being the likely point of origin. But as a new study published in Antiquity shows, the discovery of a 3,000-year-old mask in the Argentinean southern Andes suggests that more than one region was involved in the development of this important technology. The highly corroded copper mask was discovered back in 2005 in La Quebrada in the Cajón Valley. Villagers noticed the mask sticking out of the ground, and notified a team of archaeologists who had been working near the area. A subsequent excavation revealed the scattered skeletal remains of 14 individuals in a single mass grave. The pit is located near the archaeological site of Bordo Marcial, which hosted a vibrant community around 1,800 to 1,900 years ago. The grave appears to have been some kind of tomb, featuring a stone wall, and containing a copper pendent and the copper mask. The mask was laid down atop the bodies, suggesting it was used during a funeral ceremony. Because some of the bones were stained green from the copper mask, the archaeologists suspect it was buried along with the bodies in the pit. Radiocarbon dating placed the bones to some time between 1414 and 1087 BC. Historically, this was an important time for the region, as pre-Hispanic Americans transitioned from hunter-gatherers to early farming settlements. And as the new analysis of the mask by Leticia Inés Cortés and María Cristina Scattolin from the University of Buenos Aires points out, this particular population had already come across the wonders of copper. The mask measures seven inches high, six inches wide, and one millimeter thick. Holes were punctured through the mask to form a pair of eyes, a nose, and a mouth. Nine circular holes were made along the edges; a thread or some other material could have been weaved through these holes, allowing a person to wear the mask on their face. Alternately, the mask could’ve been part of a larger display, the remnants of which have not been found. The mask itself is made from pure copper, with impurities lower than one percent. The source of the raw copper probably came from the the Hualfín Valley in the Catamarca Province, which is about 43 miles (70 km) from the site, and which today hosts a major copper mine. Archeologists say the mask was manufactured by a repetitive technique in which the copper was reheated and cold hammered. The emergence of metallurgy, and copperworks in particular, represents an important stepping stone for ancient civilizations. As humans began to experiment with metals, and as they got better at crafting it to their will, civilizations developed along with it. In turn, this resulted in the expanded use of copper and, importantly, the development of bronze (bronze is a very tough metal that’s made from copper, arsenic and tin), which were better suited for weapons and tools. Plenty of archaeological evidence of early metalwork exists in the central Peruvian Andes, a technology that eventually spread to other areas of Central and South America. Evidence of copper smelting has been uncovered in Bolivia dating to between 3,160 and 2,200 years ago, and fragments of laminated copper were found in Mina Perdida, Valle del Lurín dating back to around 3,000 to 3,120 years ago. But none of these artifacts had been intentionally shaped into a recognizable form, nor where they perforated with holes or made into three-dimensional objects.